I realized last week that I never really shared out a map I made last year as for-giggles eye candy poster for an Oceans GIS Forum. 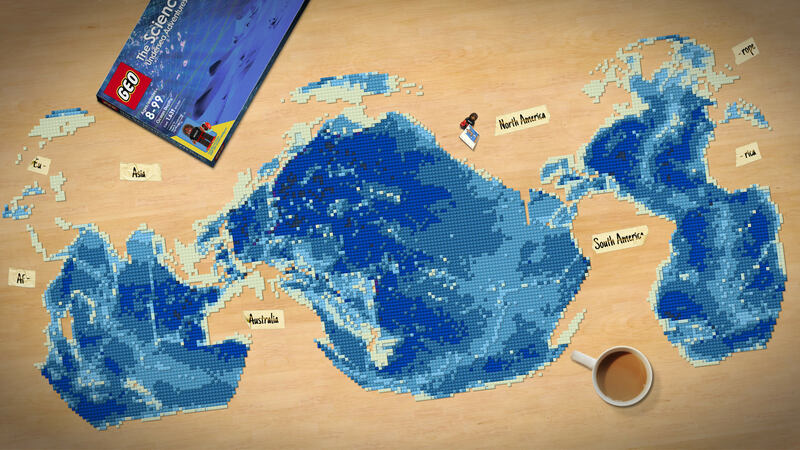 Anyway, what better way to promote the adventure and mystery of the oceans then to piece together, plastic brick by plastic brick, a Science of Where Undersea Adventure bathymetry Lego set complete with Deep Sea Dawn minifigure? P.S. Learn how this map was made, here. John – this is one of the coolest maps I’ve ever seen! I want a Deep Sea Dawn minifigure. John – this is the coolest bathymetry map I’ve ever seen. I want a Deep Sea Dawn minifigure! Thanks Shannon! Also, Deep Sea Dawn is a real person. Dr. Dawn Wright. Which is exactly why I want one! That looks fantastic, Peter! So does the rest of your portfolio. Thanks for sharing.